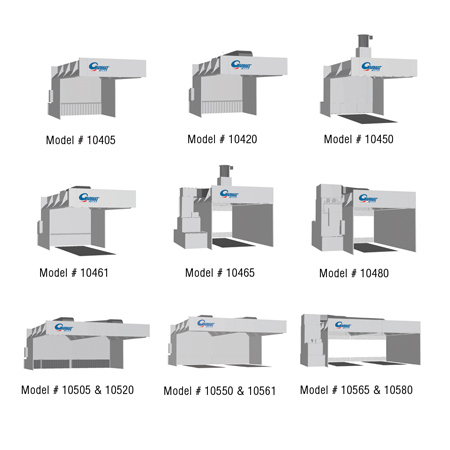 Garmat’s CTOF was the first prep station to be listed as a Closed Top Open Front Spray Booth. Unlike most prep stations, Garmat’s CTOF meets all NFPA 33 guidelines governing spray booths, giving you unlimited spraying possibilities. Prep, Prime and Paint in in one area and keep your production goals on track. In today’s competitive collision repair market, reducing job delays and improving quality are the keys to a shops’ success. Increased production by streamlining work flow is a proven alternative to a paint shop’s bottleneck. Our versatile design comes in wide variety of designs and choices of air flow configurations including downdraft and modified down draft. Fully enclosed, sewn in, galvanized chain in bottom hem for motion reduction and improved appearance. 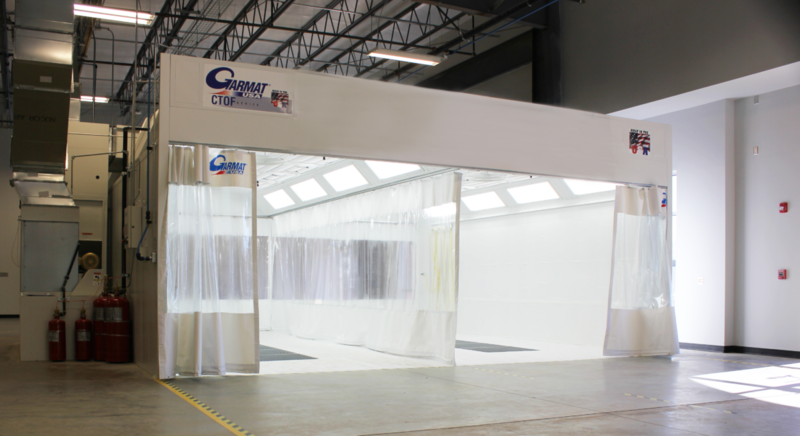 Garmat® USA’s Closed Top Open Front Spray Booths are constructed of e.g. steel with durable powder coated finish on fascia , and ceiling panels. All non-heated units are equipped with a reverse incline fan and all heated units are equipped with two reverse incline fans. Single non-heated units are standard with 5 Hp Motors. All heated and double units are standard with 10 Hp motors. Both utilize 3 phase intrinsically safe remote control panels. Complete electrical controls are provided (including motor starter, on-off switch and pneumatic controls for recycle damper). Refer to Features Table on the configuration tab for the equipment that is appropriate to your needs. All units are equipped with listed electrical panels.